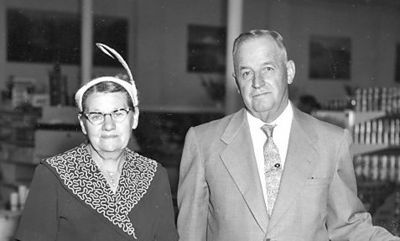 Cornelius C. Funk: businessman; born 17 July 1893 in Tiege, Molotschna Mennonite Settlement, South Russia, to Cornelius F. and Elisabeth (Andres) Funk; he was the first of seven children. In 1918 he married Susie Thiessen of Blumenheim (19 May 1895, Blumenheim Estate, South Russia - 25 January 1986, Yarrow, British Columbia), daughter of Heinrich and Anna (Voth) Thiessen. They had three sons and four daughters: Betty, Corney, Henry, Anne, Susan, Dorothy, and Arthur. Cornelius died 6 March 1985, in Chilliwack, British Columbia (BC), Canada, and was buried in Yarrow, BC. Cornelius attended the village school in Tiege, and later the Zentralschule in Ohrloff from 1907-1909. He then studied accounting by correspondence in German and Russian, while working in the family mill. In 1911 he was baptized in Kotlyarevka and joined the Mennonite Brethren Church where he remained an active member throughout his life. In 1914 Cornelius was drafted into military service and served in the medical corps on the front lines. After the war, he returned to work in the mill. However the Communist era brought severe hardship and persecution and in 1929 he and his family fled to Moscow in order to emigrate, eventually passing through the Red Gate at Riga to “freedom” (in later years he wrote the book Escape to Freedom). In February 1930, Cornelius, his wife, and four children arrived in St. John, New Brunswick. They settled in Gnadenthal, Manitoba from 1930-1932, and in Coaldale, Alberta from 1932-1933. The family then moved to Yarrow, British Columbia, where they remained for the rest of their lives. Cornelius tried mixed farming until 1939 when he started a feed/grocery and feed mill business with his sons, which remained his life’s work. When the mill in Yarrow burned in 1964, the business was moved to Clearbrook and rebuilt. Both the mill and the new grocery store prospered in the new location. The grocery store remained in the family for several decades to the point where it was owned and operated by a third generation descendant until it finally closed in 2008. Socializing with people of all ages gave Cornelius much pleasure, and he loved an audience to whom he could relate his interesting life story. He enjoyed music and attended local concerts as well as the Vancouver Symphony for a number of years. He enjoyed a challenge, and was already in his eighties when he memorized Psalm 119, which he recited often. Cornelius never fully retired, remaining involved in the business, but he took time to read books in German, Russian, and English, as well as to correspond with relatives and friends in Germany and the Ukraine. Cornelius C. Funk often expressed his dependence on the grace of God and his conviction that his earthly possessions were nothing compared to the riches he had in Christ. Funk, Annie. “Personal Papers.” Chilliwack, B.C. Funk, Cornelius C. Escape to Freedom. Hillsboro, KS: Mennonite Brethren Publishing House, 1982. Funk, Annie and Dorothy Funk Fast. "Funk, Cornelius C. (1893-1985)." Global Anabaptist Mennonite Encyclopedia Online. December 2004. Web. 23 Apr 2019. http://gameo.org/index.php?title=Funk,_Cornelius_C._(1893-1985)&oldid=115043. Funk, Annie and Dorothy Funk Fast. (December 2004). Funk, Cornelius C. (1893-1985). Global Anabaptist Mennonite Encyclopedia Online. Retrieved 23 April 2019, from http://gameo.org/index.php?title=Funk,_Cornelius_C._(1893-1985)&oldid=115043. This page was last modified on 5 March 2014, at 22:01.